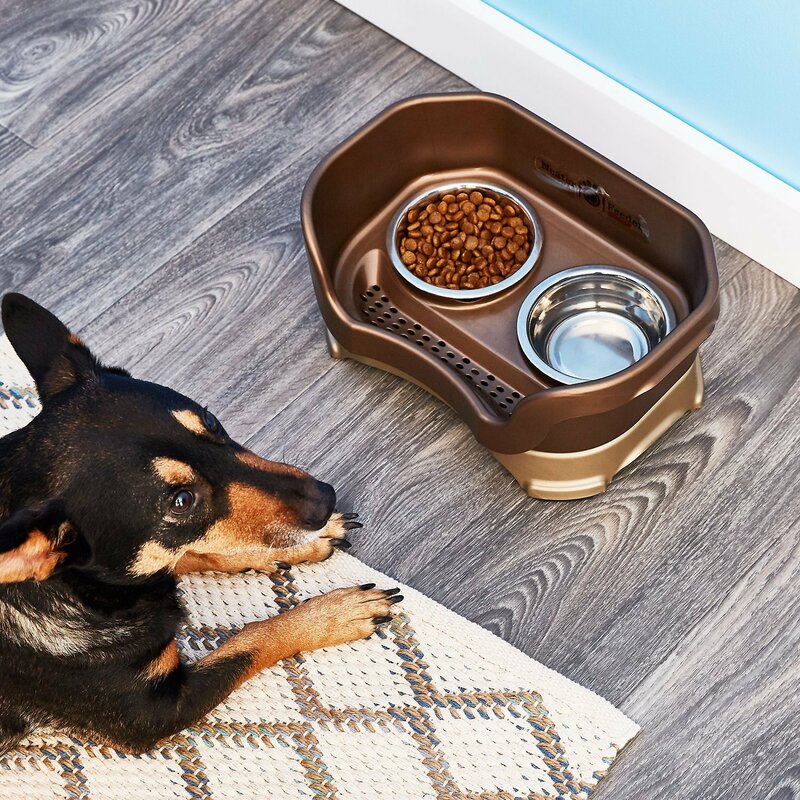 The Neater Feeder solves the pet food mess problem and protects your floors! It's designed with protective walls to contain splashes and spills from an inadvertent kick or an excited pet. The revolutionary system holds spilled food in an upper reservoir while spilled water flows down a gentle slope through a filtering system. The spilled water drains into a lower reservoir that can safely contain more than an entire bowl of spilled water, keeping it off the floor until you are ready to dispose of it. Keeping the spilled food in the upper reservoir, off the floor, not only saves you work, but also keeps it clean for reuse. 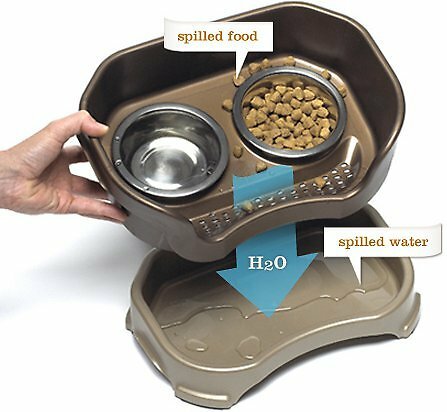 Contains and separates spilled food from spilled water and keeps spilled water off your floor. Protects floors and walls from stains, mold and damage. 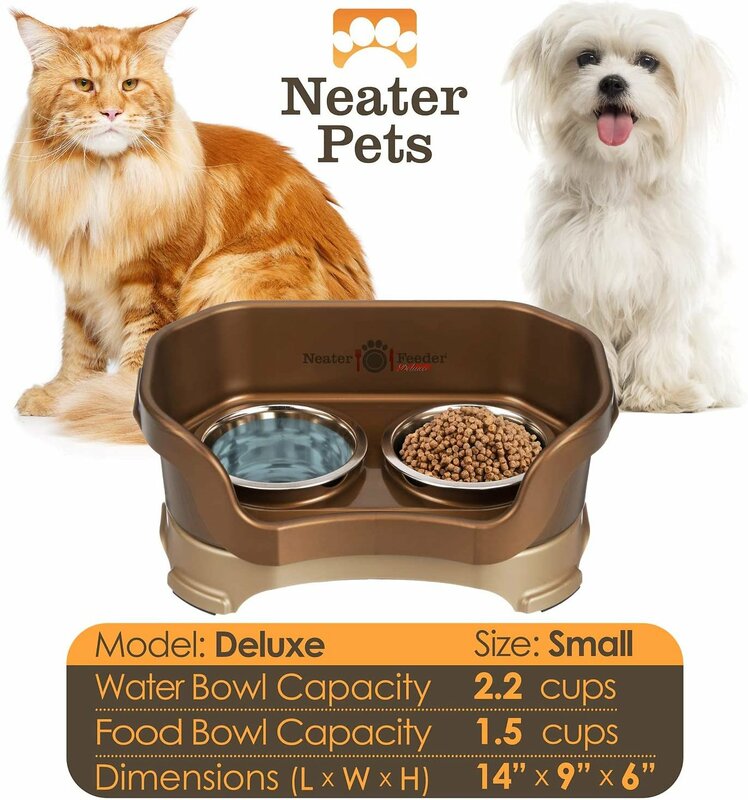 Provides a healthier eating environment for your pet and deters pests from getting to your pet's food or water. Elevated design to improve comfort and digestion and helps to reduce neck and joint strain. Attractive colors and stylish design fits well in your home. Not sure how many other people's dog likes to blow bubbles in their dog bowl, but mine has made it a hobby of hers. She gets water everywhere, we tried using a mat (the one pictured underneath) with her normal dog feeder, but she still managed to get water beyond the point of the mat. Thankfully I was told about the neater feeder & decided to give it a shot. Y’all, it works amazing! It catches all of the water my dog splashes out & makes cleaning up a million times easier. No more soaked floors! I bought this for my dogs I have a mastiff and 3 smaller dogs. I bought the large but I should have bought the small or medium. The drain is in the front and the bowls sit towards the back, my smaller dogs cant really reach the bowls. So if you have small to medium dogs Don't get the large they cant reach the bowls. I think I'm going to send it back only for that reason. Its well made and nice looking. My puppy would flip over his water bowl and there would be water everywhere. Now, no more water no matter how much he splashes, unless he runs away for the feeder with his face dripping with water. He's a lab, and it happens. One suggestion I have is if they could create a storage container that would fit underneath for food. That would be amazing and would save space! Possibly lifting up the food bowl to access the storage? Stop thinking about this product and buy! This is exactly what I needed for my standard poodle! He is now able to eat and drink without having to stoop so far over. His big head and mouth always splashed water all over our kitchen floor and although I was skeptical that this would solve that issue it really did. No more slipping when you least expect it or having to dry the floor so guest and other won’t slip. It’s well built, stylish looking, and super functional! I highly recommend this product. 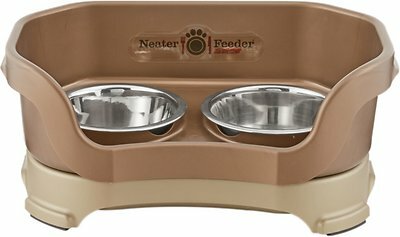 Saw the neater feeder awhile ago, read the reviews, decided we had to try something beyond the standard water bowl on the floor approach. We have a large German Shepherd who apparently only drinks by putting his entire muzzle into the water and then drips it all over our floors outside of the water bowl. We got this feeder for the water and it's been a godsend! Now most of the water that doesn't go down his throat gets contained and captured underneath and then we empty every several days. I liked it so much that we got one to put in our motorhome since we bring our dogs with us. Can't recommend this highly enough - well worth the investment! This is a nice product and I am pretty satisfied but I will tell you the good and bad. The good: It looks nice and seems to be good quality plastic. The extender legs are easily placed and the whole thing is easy to assemble. Looks muck better than a couple of bowls on a mat. The not great (nothing bad: The bowls are thin metal, wish they had been more substantial. The bowls do not fit snug into the holes, my dog is skittish so I had to put some foam around the bowl so it wouldn't move around when he was eating. It does stop spills inside the bowl area but if you have a messy drinker you are still going to have water on your floor.. but I'd say less at least. The feeder is so light weight he has flipped it over several times (even w/water in it). Hopefully, he will learn not to do that. Honestly, though, if it hadn’t been so expensive, we probably would be using it. I have a Great Pyrenees who sticks most of her face in the water dish. She gets water everywhere and would spill her food too. I had a raised feeder that she would scoot around the floor or just knock over trying to get the spilled food. This feeder catches the water and the spilled food. I should have gotten this for her sooner. Much easier for me to keep the feeding area clean too. It just wipes up and looks great.